I loved this book. It was recommended to me by a former teacher. She thought it would be a good read for my work with youth. 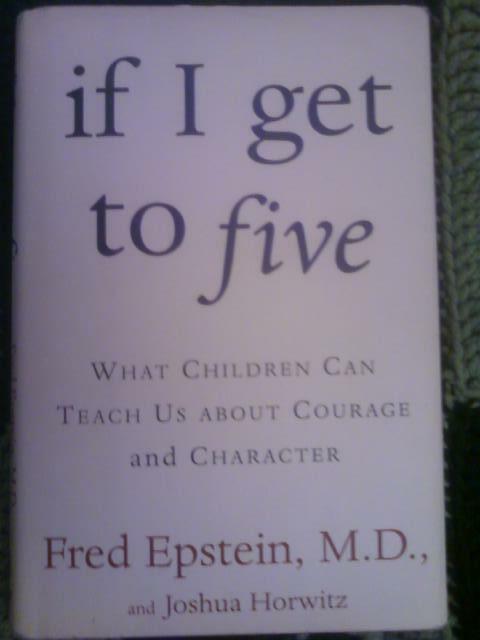 “If I Get to Five: What Children Can Teach Us About Courage and Character” is written by Fred Epstein M.D. and is a inspirational and fun. He highlights several children, young adults and their parents who survived or died from inoperable tumors. It could have been a total downer, but it’s not. It is the best reminder of how amazing children are and the strength and beliefs they can show in the most terrifying of situations. Can you imagine being 8 years old and undergoing multiple surgeries or chemo treatments for months or years? I honestly cannot. The worst physical injury I have survived is a broken ankle. I thought that was bad. I was in the worst mood during that time. Maybe I could have been a bit brighter if I had read this book during my bed rest and therapy. It is a short read and one I recommend EVERYONE READ because it crosses cultural, economic, gender, and racial lines. The children and families in this book could be you or me. Some of you reading this are and have been going through physical pain for some time. Despite the grim prognosis given to many children, their spirited stories had me laughing and reminded me how wonderful life is if we only take the time to let it be. As I used to work near a children’s hospital,I know that any time spent near a pediatric oncology unit is truly transformative. Neat. Thank you for chiming in.